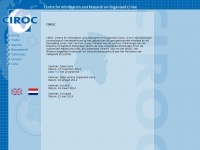 CIROC, Centre for Information and Research on Organised Crime, is an international centre for information and research on organised crime and the fight against it. Design Valley - Ede is specified as the websites creator. The web server used by Ciroc.nl is located in Netherlands and run by Duocast B.V.. 30 other websites are located on this web server. Most of them are provided in the english language. Only a few websites on this web server are x-rated. The websites of Ciroc.nl are served by a Apache server. The HTML pages were created with the latest standard HTML 5. The visitor analysis software Google Analytics is used to analyze the visitors of the websites. Due to the robot information on the webpage, the following actions by webcrawlers are not allowed: using the description of the website from the Yahoo directory and using the description of the website from the Open Directory project. All other actions by webcrawlers are allowed. The homepage of the website is "/en/home.html".